TSCM requirements for Communications Systems Analysis is best exemplified by our specialized instrumentation. We are capable of testing all types of communications systems analysis, including: digital, VoIP and POTS telephone systems, and Wi-Fi. Some unexpected items included under the Communications Systems Analysis heading include Internet connected devices: doorbells, surveillance cameras, cordless phones, baby monitors, etc. 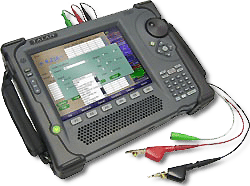 Unlike outdated test equipment used by less-equipped firms, the latest TSCM technology doesn’t damage digital circuits and devices. Considering the consequential damages of a communications system being blown off-line, this is extremely important. In addition to inspecting the end equipment (phones, speakerphones, faxes, video teleconferencing systems, etc. ), part of the inspection process includes an examination of all wiring for deeply embedded bugs such as wiretaps and transmitters. We also discreetly seal (at your option) all items we inspect, using custom-made, serialized, nearly invisible security seals. This added level of security makes it easy for you to monitor if a new intrusion or comprise has occurred. Any tampering to these seals is a red flag indicating someone has accessed your communication equipment without authorization. Subsequent TSCM inspections include protocols to ensure every previously inspected item still has an unbroken seal. Any damaged or missing seals may indicate tampering. A missing seal may also indicate the object we sealed was replaced with a pre-bugged, identical-looking item. Either condition is a suspicious incident which should be investigated further. Tip: Modern communications systems come pre-loaded with features, many of which are eavesdropper-friendly, like auto-answer. Employees know about them, and are not afraid to use them. We identify these vulnerabilities during our inspections, point them out to our clients, and provide protective solutions. If you have any questions about the TSCM services provided by Murray Associates, simply fill out the form below, or call us from a safe area and phone.